Saint John the Evangelist Parish is a Roman Catholic Community located at 2400 West Ridge Road in Greece, New York and was founded in 1865. The parish campus consists of the Church, the Rectory, and the Parish Center; however, the most important element of our parish is our faith community. The clergy and staff are what makes the parish strong and functional with the presence of God in the community. Rev. Peter Enyan-Boadu is the current Pastor who has been with the parish since June 2012. Fr. Peter began a new tradition within the family of St John’s Catholic Church. Our family is known to its members as: "St. John’s, the beloved one!" The history of the Town of Greece and St John’s Church is closely tied to the unfolding history and development of Eastman Kodak in Rochester. The early years of Kodak’s growth turned the quiet cross-roads church into a bustling suburban parish. It was in 1891 when George Eastman located his factory at the corner of Lake Avenue Boulevard and Lewiston Avenue (now Ridge Road West). Soon new residential streets opened up in the northwest section of Rochester. In 1910, Bishop Thomas Hickey, second Bishop of Rochester, called upon the pastor of St John’s, Rev. George Eckl, to begin a census of the upper Tenth Ward of Rochester. Each day during the summer, the zealous young pastor would hitch up his buggy and drive to town to canvas the growing neighborhood. One result of this census was the founding of Sacred Heart Cathedral. The gradual trickle of young home owners from Rochester turned into a flood-tide after World War II. The original 20 families of 1865 had grown to 400 in 1949 and 1500 in 1959. Parochial school enrollment reach 1001 in 1955. Expansion of this size meant increased pastoral problems. The building on Ridge Road West (which in recent years housed Oakdale Piano and Rosa & Sullivan’s) was the second Catholic Church built in the Town of Greece. As Greece kept growing and growing, the early seeds of immigrant faith flourished. From 1882 to 1908 members of what was then the mission at Holy Ghost in Coldwater were sharing St John’s priest for services on alternating Sundays. The little church on the Ridge had become completely inadequate. A school addition in 1955 provided an auditorium as a Sunday chapel. From Christmas 1954 to November 15, 1964 the growing swell of new faces endured hard kneelers, folding chairs, and oppressive heat in this school chapel. And, the three parish priests began a ten-Mass Sunday schedule with sermons in the two locations. It was in that year, Bishop James E. Kearney gave permission to start the new St. John’s Church. The pastor, Rev. Donald Lux, planned to build a church unique to the area. 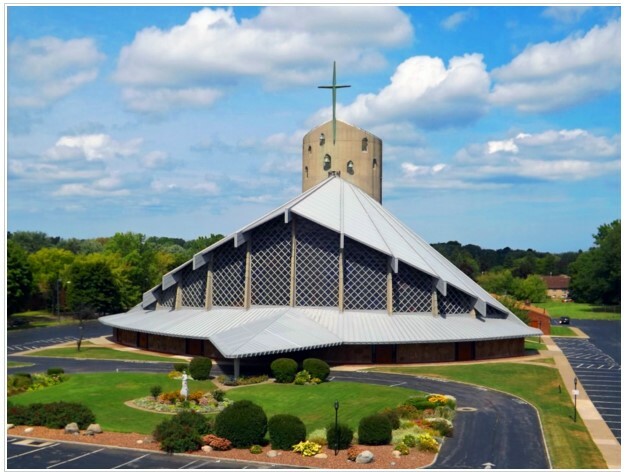 The architect, Mr. James Johnson, was commissioned by Bishop Kearney to draw up a plan for a church which would accommodate the growing population, and also serve the liturgical needs of a deeper Eucharistic life, while staying within the financial means of its parishioners. On May 6, 1963, the ground breaking ceremonies were held. By the Fall of 1963, the cornerstone was ready; on Sunday afternoon, September 15, 1963, Bishop Kearney laid the cornerstone. The first Mass in the new church was offered on Saturday, November 7, 1964 by Father Lux. As a beautiful exclamation point to the opening Mass, St John’s First Holy Communion Class was present. Over the years, the parishioners of St John’s have experienced many changes. While our old church still stands, it is no longer used by our parish. Our old rectory was replaced by a new rectory in 1980. The new rectory serves as the parish office and houses the priests in residency. The parish center was added to our campus and was erected in 1981. It serves as a wonderful facility for social gatherings and meetings. In 2015, we came together as a community in celebration of our 150th Parish Anniversary. We are grateful to God for the many blessings we enjoyed over the years and we continue to rely on God's grace for our future. "St. John's, the beloved one! The beloved one, St. John's!"